IMPORTANT: Please note that the information you provide is not sent directly to the chosen hotel. All hotel bookings are received and followed up by our partner Alexander Tour Ltd., a certified touroperator with Touroperator / Travelagent license No. : 03392 (issued by the Bulgarian Ministry of Economy), member of IATA (numeric code 09-209896) and BATA (Bulgarian Association of Travel Agents). 1. Please, fill the booking form and a representative of Alexander Tour will contact you shortly. 2. To proceed with a reservation you will be asked to fill and sign the following authorization form. 3. You will be asked to send the authorization form to fax number +359 2 983 33 22 to our reservation center. 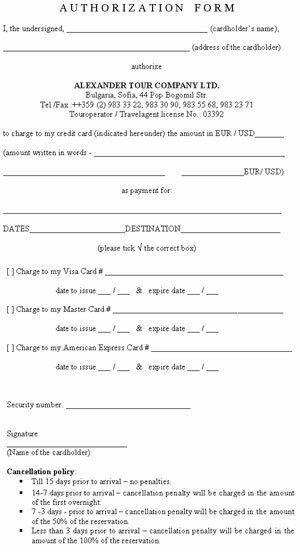 Your credit card will be charged only in case of availability for the requested period. 4. Please note that we do not make reservations without an advance payment from your side! 5. You will receive a voucher for the accommodation.